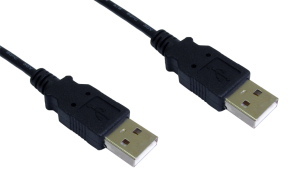 1.8m A to A USB cable, can be used with USB 2.0 devices or older USB 1.1 devices. USB type A male to USB type A male. The KVM-DVUSB04 is a compact sturdy four port DVI-I KVM switch with USB keyboard and mouse support plus one extra USB device. Supports both DVI-A and DVI-D signals. A high quality cable kit for connecting your PC video card to your TV scart connector. 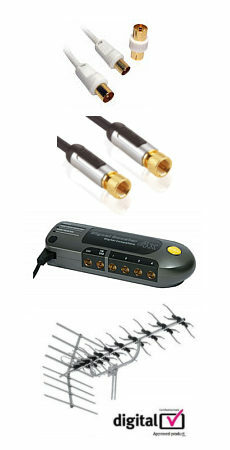 The kit features the following components:- S-Video / SVHS high quality video cable, fully shielded high definition oxygen free copper cable, attractive silver finish connectors with gold plated contacts. 2 x phono to 3.5mm stereo audio cable for connection between sound card and scart adapter. OFC Cable, metal body connectors with gold plated contacts. Scart adapter with gold plated contacts, connectors for s-video, composite video, left and right audio. USB Active Extension Cable with 4 Port USB Hub 12m Length 12 meters USB extension with built in 4 port USB hub Active extension cable. Fully compliant with USB 1.1 & 2.0 specification. Connectors USB A female to USB A male. Data transfer up to 480Mbps. No power needed.